Ah, gallery walls. They are the bread to my butter, and “my butter” being my home. You need bread for butter and I need a gallery wall for my home, simple as that. I have a really hard time not having a gallery wall in every room, I love the collection of pictures, drawings, shells, art… I could go on….It makes a room feel so cozy! 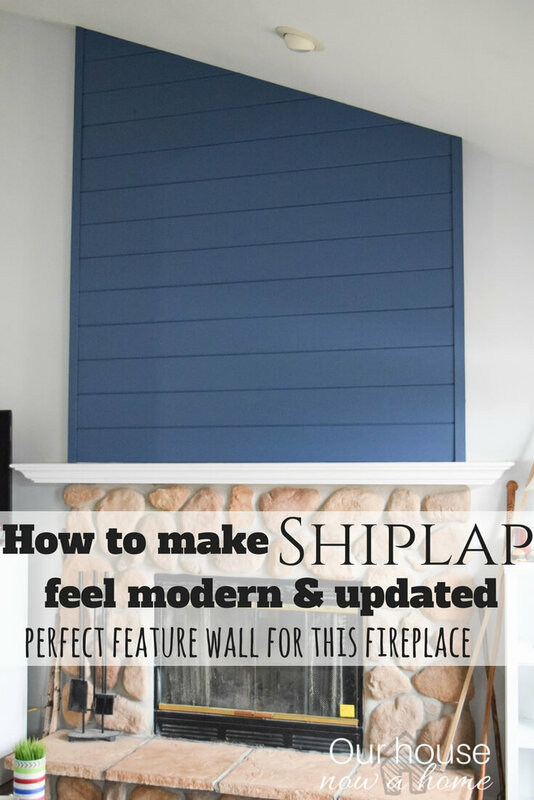 I know a lot of people can get overwhelmed in creating a gallery wall of their own, which is why I am breaking down How to update a gallery wall, making a statement. I had a gallery wall in my living room, which worked but I wanted to take it to another level. 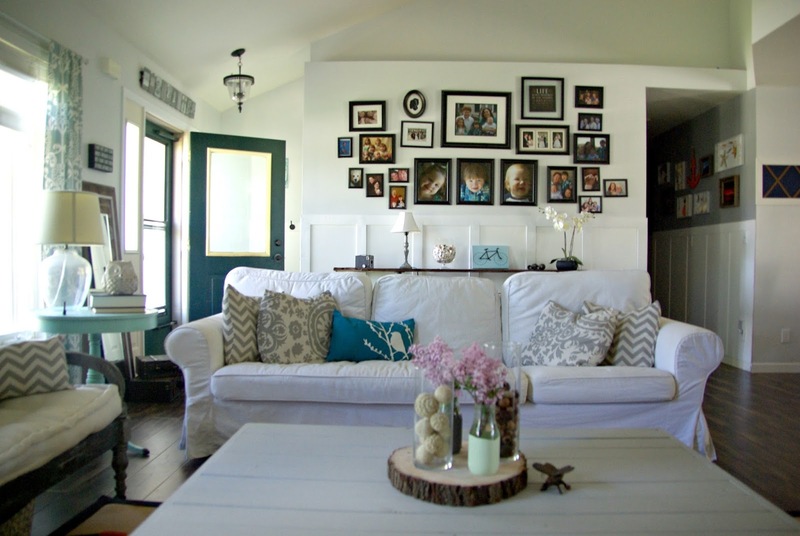 When I rearranged the furniture in our living room this wall became a gorgeous backdrop to the sofa. 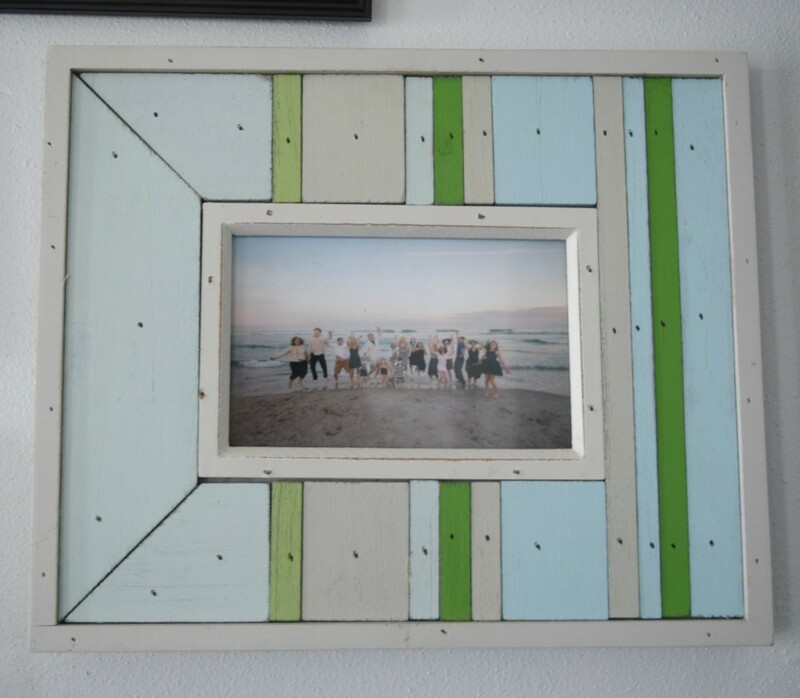 I had collected some frames over the years and filled them with pictures. Setting up the gallery wall with not a lot of thought. It got the job done, I had pictures of my kids on the wall. But, this wall is massive, I felt it could become a statement in my entryway and living room. 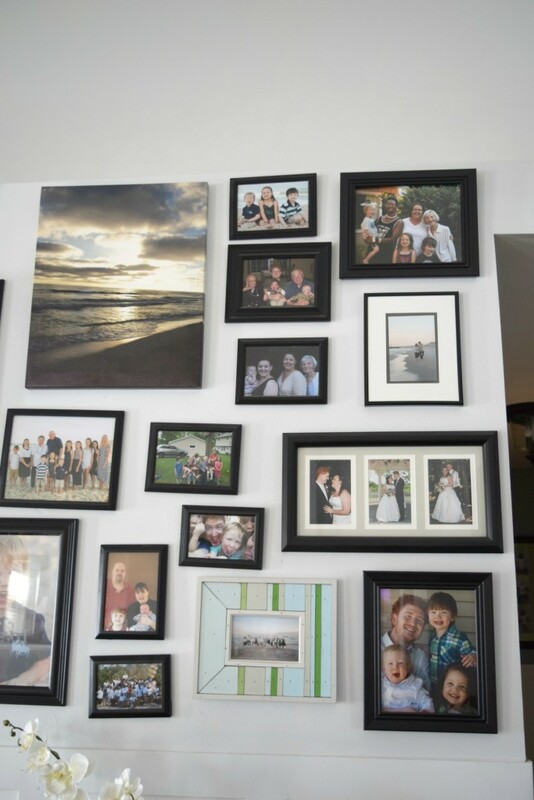 I also wanted to display pictures of us, our extended family and friends in a more thought out approach. The first step was to find the pictures I knew I wanted to be featured here. I sized them and printed them out. I purchased a few more frames in the desired size and had two large canvas’s that I created a few years ago. The key for most gallery walls is to have both sides feel even. This does not mean uniform on both sides, but big on both sides, smaller on both sides. Keeping things balanced, I used this rule of thumb when planning out the pictures I chose. Here is what I ended up with. I will explain the steps I took, which you can see by the corresponding number on the wall. 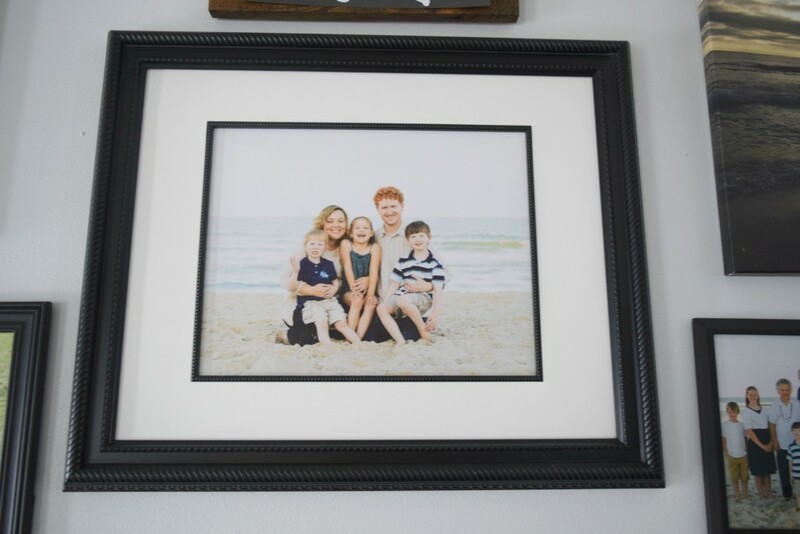 Our family picture is the big and fancy frame. I centered that in the middle of the wall. We have always had a few formal pictures of the kids taken once a year, these are 11×14 and are lined in the bottom center. A more informal set of pictures of my kid’s line the far left, going up and down. This gives the gallery wall a middle and side. The two canvas are part of the “balancing” of the gallery wall. Because they are similar in color and size they work well on either side of the center. Now we go opposite the top of the canvas, with two colorful wood frames. Adding some fun and color to this wall. They are on the interior of the side images. Now the right side needs to be formed, lining up large-ish frames to create the other side of this gallery wall. Filling in the center with two 8×10 and a 5×7 and a few 4×6’s. These break up the big picture trend and allow for filler in the center. Again, going to the right and filling in from the center to the far side. 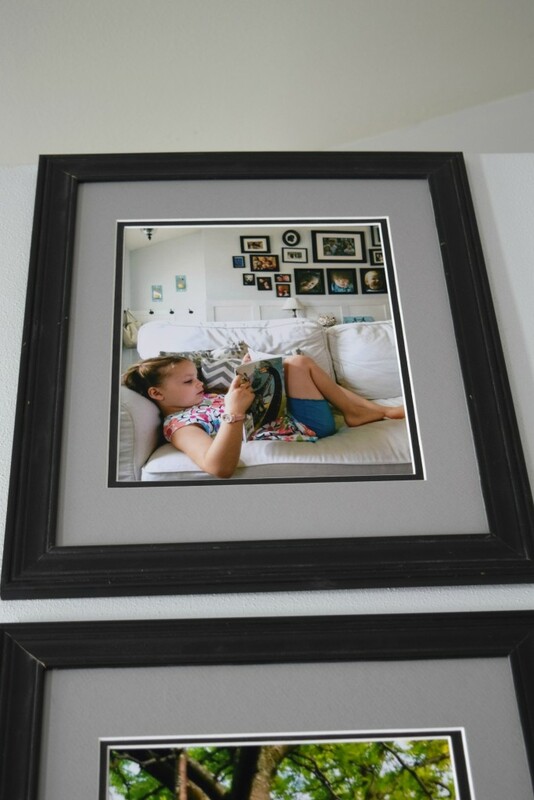 Using smaller frames is a great visual contrast to the larger prints on the wall. That is it! I am always very mindful of each side. This is why I like to break it down into a center, then a right and left side. Keeping track of the number of frames on each side and the amount of sizes on each side. It seems like a lot to keep track of, but once you begin sorting pictures you can set them in piles of right, left or center. Once you start seeing it come together you will find a few holes that need to be filled. Dale’s parents always had their kids get professional pictures once a year. We try to keep up with that tradition and these were taken on vacation last year. These are about as formal as my kid’s get. This is a perfect example of me realizing there was a hole in the gallery wall. I had a narrow spot and no picture to go there above our family picture. I created this Silhouette wall art. Because I made it myself I was able to tailor the size to fit that spot perfectly. This is what DIY is all about! If I had planned to purchase something for this spot it would have taken me traipsing around with 1,2, or all 3 kids, possibly a husband tagging along and a few stores. 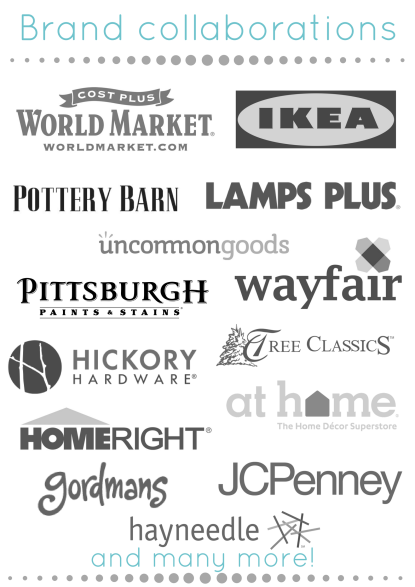 Where I would hopefully find exactly what I was looking for, or accept defeat and come home to do some online shopping. What I mean is, when in doubt, DIY it! This set of three pictures on the left side of the gallery wall are my absolute favorite. We have the formal ones in the center, and these are more informal. They were snapshots taken while my kid’s were being perfectly them. Here is Gavin skateboarding. Caleb is our pure sunshine and here is is with the biggest smile ever, giggling like crazy while sitting in a tree. Nora, my bookworm, when she is home this is her spot where she will read for hours. I liked the idea of making this gallery feel more “us” than others. I am not here to impress anyone and never decorate for the few times a year we entertain. 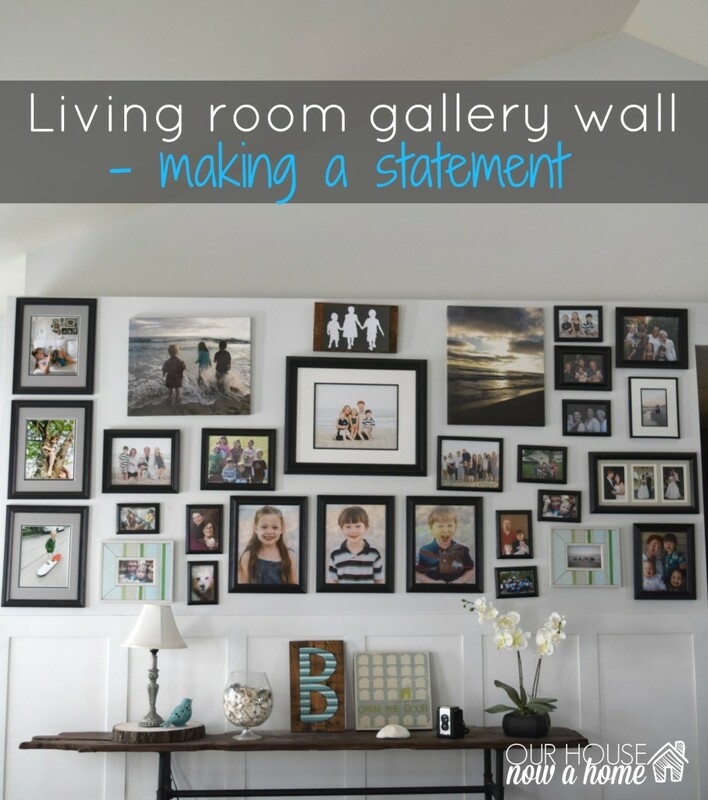 This home is ours and it needs to reflect that, this gallery wall is a mix of fun, laughs, moments, love… us. I took these two pictures that are printed on canvas when we were in California a few years ago. I was not hip to photo editing and should have lightened them up more, but they are still great moments we had on vacation! With the contrast of the black and white frames I felt a little color was needed. These great wood frames with blues and greens was the pop of color I was envisioning. 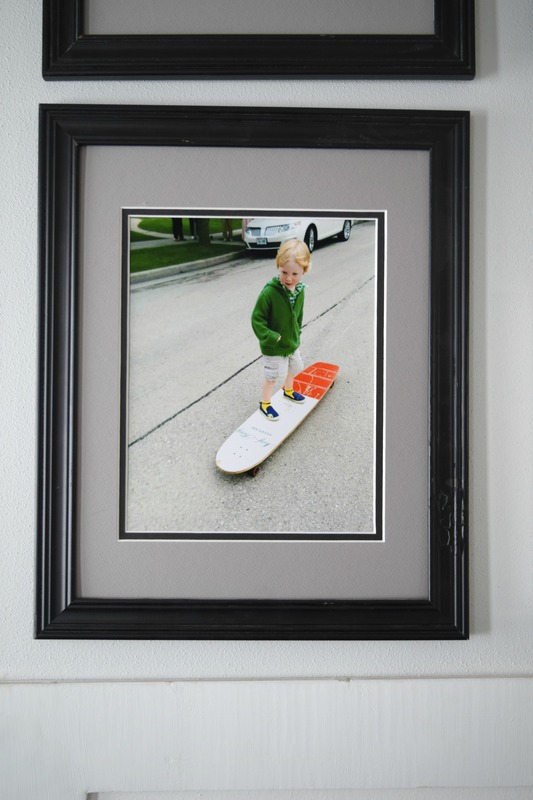 I think most frames in a gallery wall need to be similar, either in finish or color. But having a few with a different theme just added to the overall look of it. I keep things fair around here, obsessively fair. We have even amounts of my side of the family and Dale’s. We have a 4 generation picture with my Mom, Grandma, Nora and I. Then a 4 generation picture with Dale, his Dad, Grandpa and our boy’s. With our kids there is no his or mine, it is all Family. 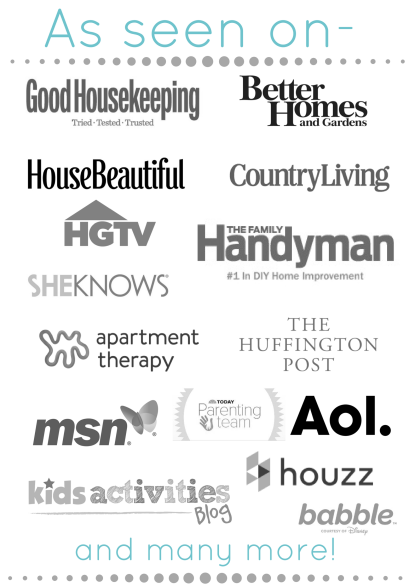 These are the people that make our lives full, our weekends hectic, our birthday parties loud and our kids loved. They deserve some room to shine in our home too. I just created that letter B with washi tape. The console table was made large for this wall, I knew the space could handle the narrow and long table. Now the Gallery wall fits the wall as well. I stretched it out by adding more pictures and having it go from end to end. 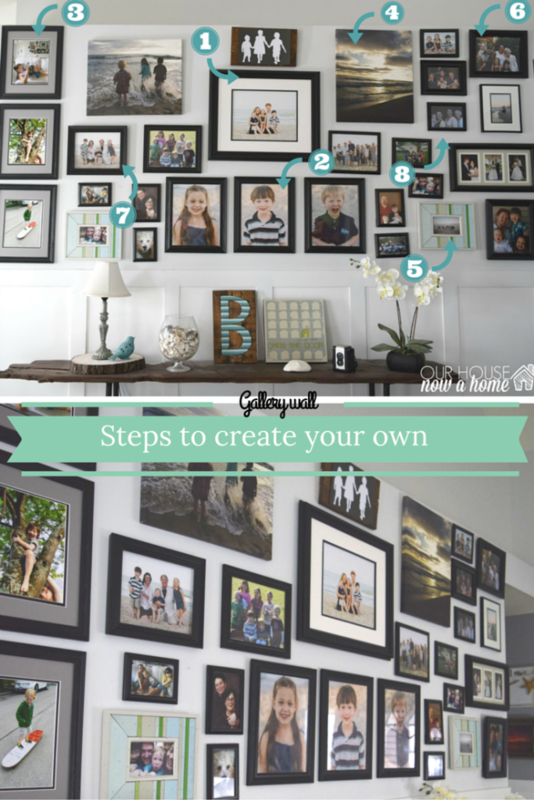 How to update a gallery wall, making a statement was done simply by starting in the center and working your way out. The statement came in with the contrast of the black frames and light walls. But more importantly it is a statement now because the gallery wall fills the entire wall. I worried that it would be too much for this space, too cluttered. I don’t feel that is a concern anymore and it actually makes the wall feel larger then it did before. There is a ledge right where the top of the pictures hit, this was a built in the 90’s house where alcoves and ledges were the sh** back then. I have never known what to do with that ledge, Nora wants to put bookshelves up there and a ladder to make her library dreams come true. Dale wants to close it in with drywall and forget it exists. My boy’s just like to get paper airplanes stuck up there. I am thinking a big, mega, over sized clock would look great. For now it sits empty and this gallery wall is all of the statement we get. 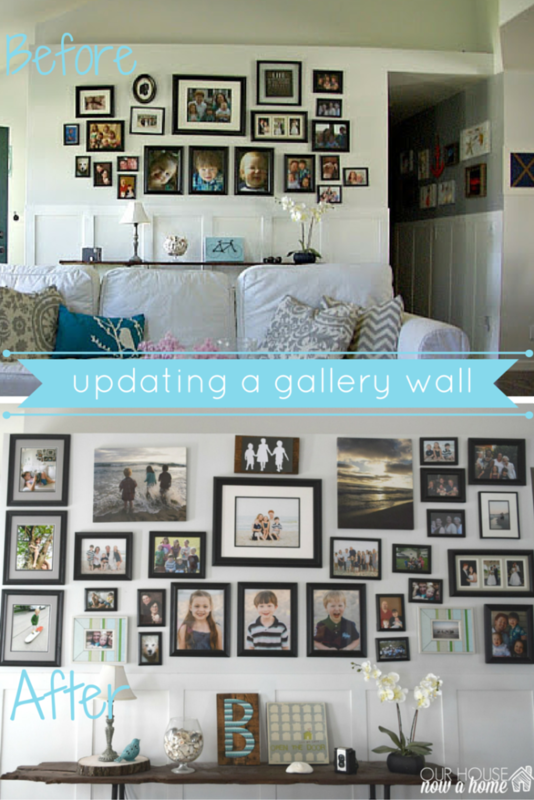 I think this before & after shows perfectly what a few more pictures can do to a gallery wall. I pretty much filled this wall with pictures and instead of it feeling cluttered it feels fully designed and thought out. I would have loved to give a wide shot of this space, really I would have…. …. but I had sick kids at home from school who were glued to the sofa. I annoyed them enough by standing in front of the TV to take these pictures. This is as real as it gets, sick kids, a stalker dog and a new gallery wall! When I have no sick kid’s and a clean living room I will share some wide shots of this room, I just need both to happen at the same time. Which is a lot to ask for this house with 5 people and two dogs! I will also be sharing a video showing the process of this being put together, how I layered the pictures in. Be looking out for that! 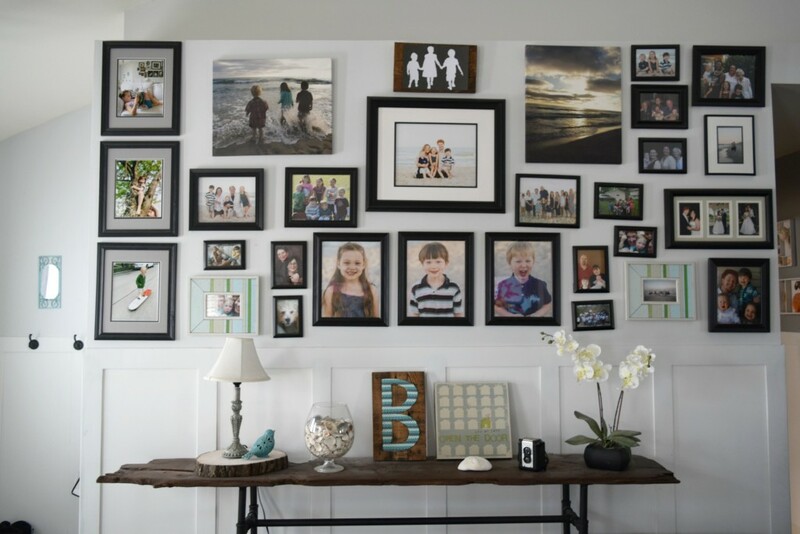 How to update a gallery wall, making a statement is a fun way to add a focal point to a room. 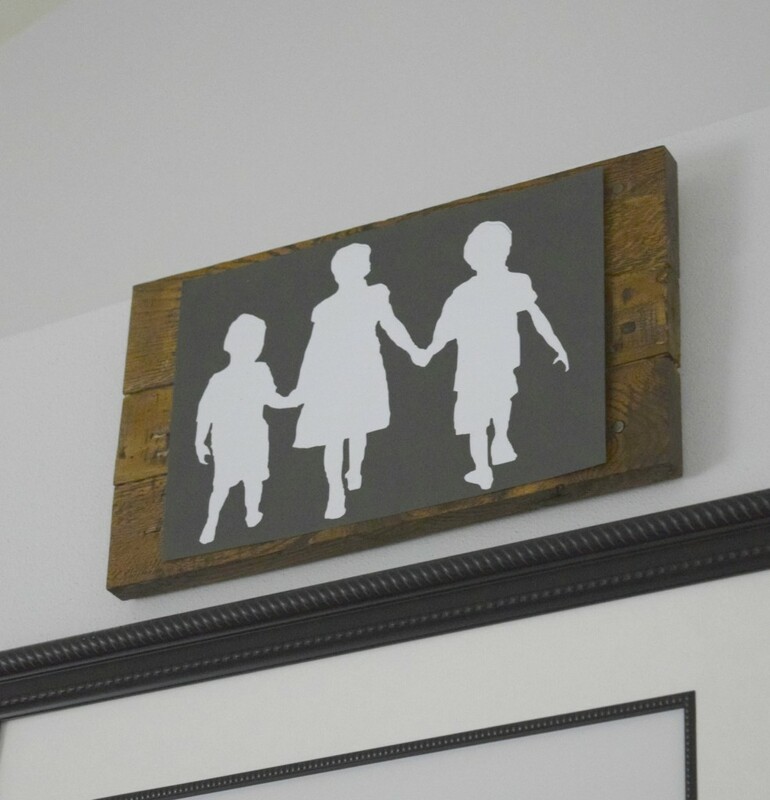 It also allows a personal touch to a home, since you can get creative by using pictures, kid’s drawings, anything that means something to you. 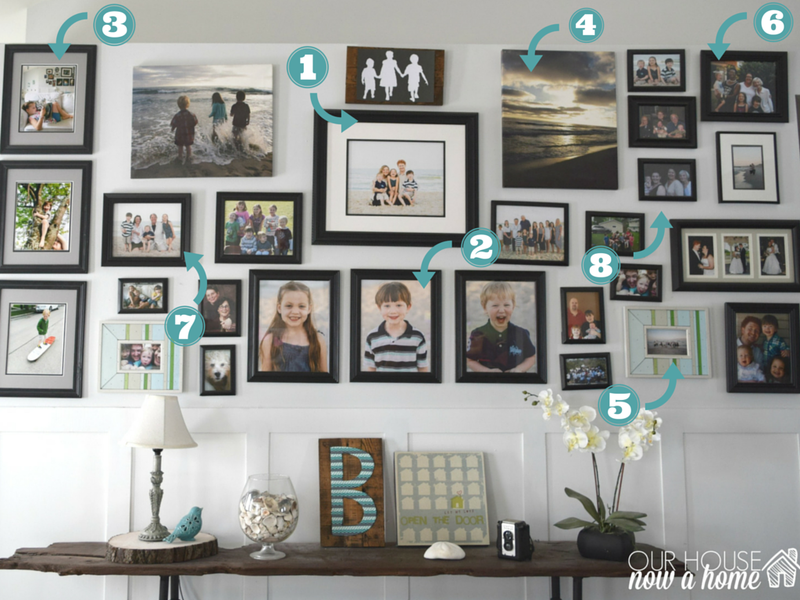 You can add it into a gallery wall and really make the space feel perfectly “you.” Selecting the pictures or theme you want, finding frame’s for it and then starting in the middle and working you way out is the best plan of attack for these. You can measure out the wall space and mark it on the ground to then lay out the pictures if you are not sure of hanging them and then building from there. Using paper templates, or winging it like me. The worst that happens is some don’t work in the formation you have and you take it down and try again. Give it a try! Are you as obsessed with gallery walls as I am?! Gallery walls can overtake a smaller house for sure. 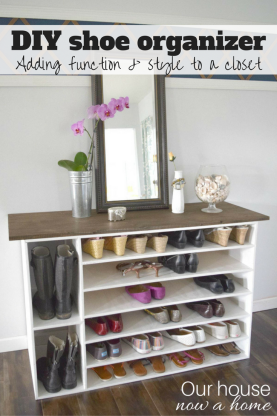 I actually have a space in my living room that I’ve been thinking of doing this with. 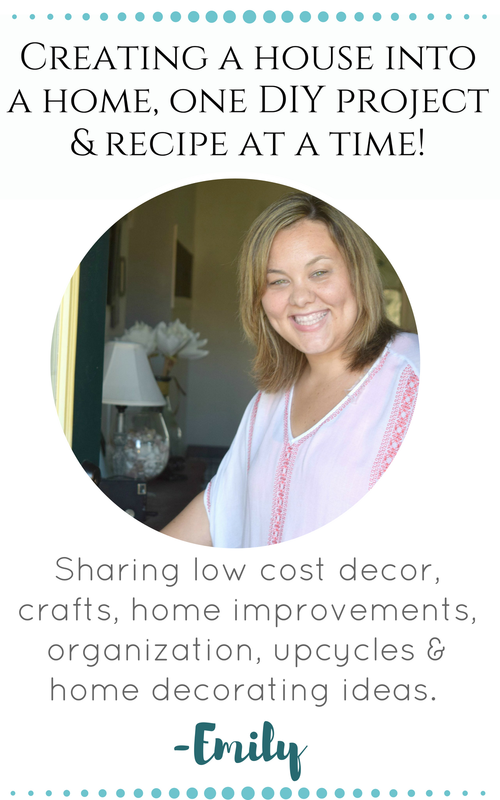 I love your wall and might take a few of your tips when it comes to doing mine. 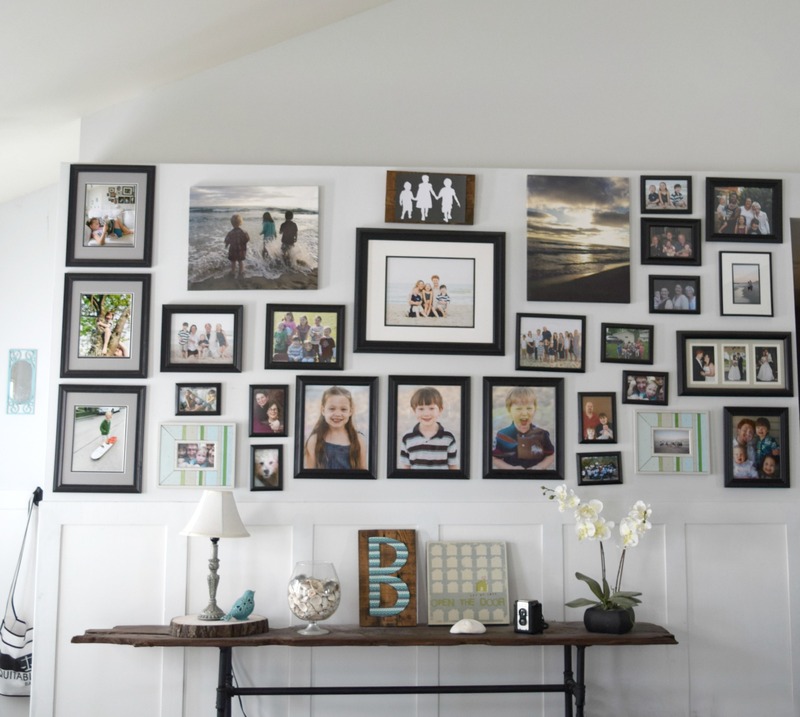 Have fun putting up a gallery wall in your living room! Your photo gallery is beautiful! I also love the B you made with the washi tape. I have to try doing that! Thank you! The washi tape B was so simple, just tape and a cardboard cut out letter. I read this with interest! 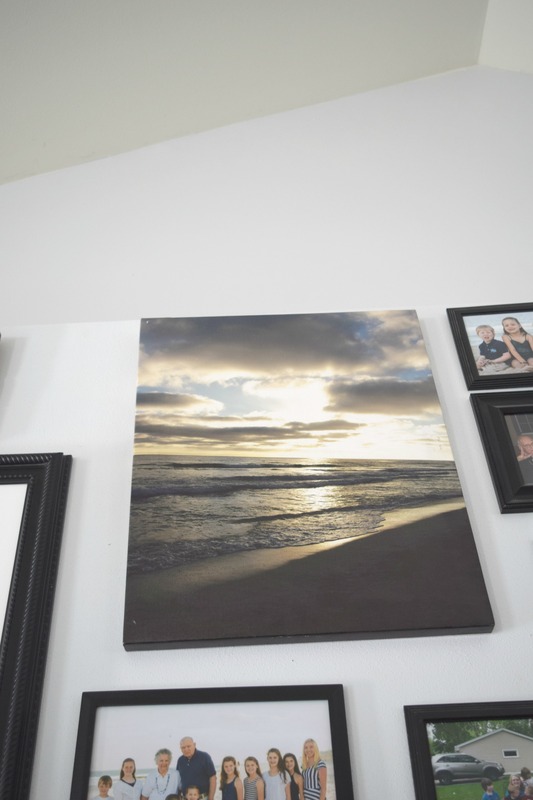 As a professional photographer, people often ask me about printing and wall placement. I love the concept of the canvases balancing the others. Thank you so much! Now I am all nervous that a professional photographer was looking at my pictures, eek! Gorgeous family pictures! 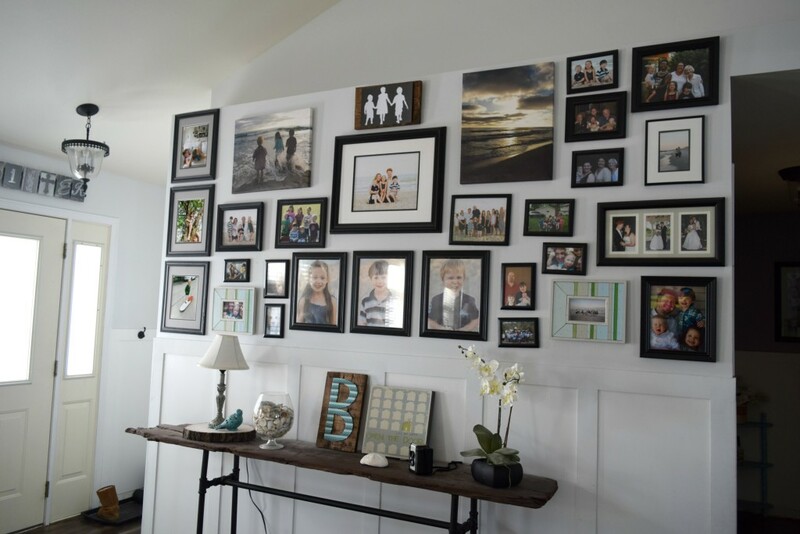 Love a good gallery wall, thanks for sharing it! I love the idea of gallery walls. I have been wanting to make one but I haven’t gotten around to it. 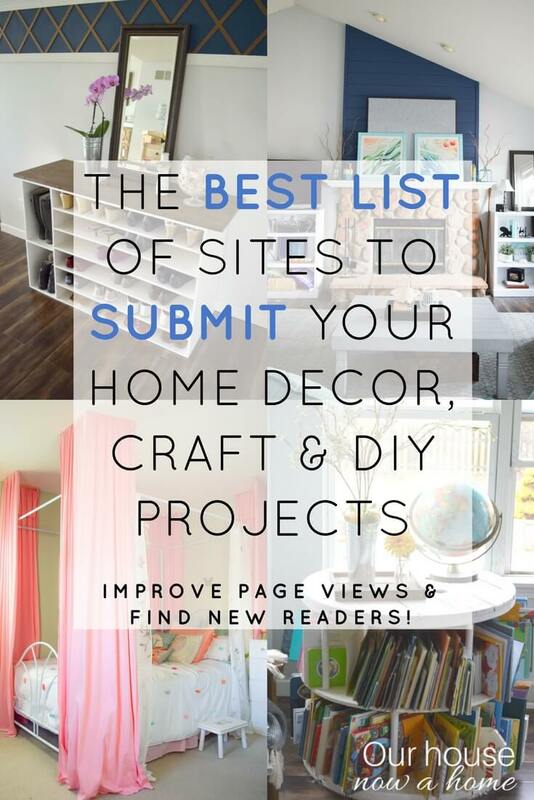 It is such a great idea to create a nice focal point that means something to you! We have a gallery wall in our family room. As you go across it tells a story. I love it. I adore seeing others gallery walls, the story and people in it are so special to that person. I love your gallery wall! I really want to do one in our new house. Thanks for your inspiration. I love the refresh on your gallery wall, Emily! Looks great. Love how it displays the character of your family! Love your wall gallery, love the pictures and how you’ve arranged them! LOoks great. I need to do this with our pictures too. Thank you for the inspiration! I am so happy you enjoyed this! That wall looks amazing! I love having our family photos hanging up around our house. I do too! I always worry my kids will have this complex of assuming they are a big deal, they are to me. You can tell by all of the pictures of them in my home, it is normal for them. I truly believe that photos make a home. I am a big time frame person and I love the usage of frames here. Gorgeous! I am so happy this came at the right time, good luck creating your gallery wall! 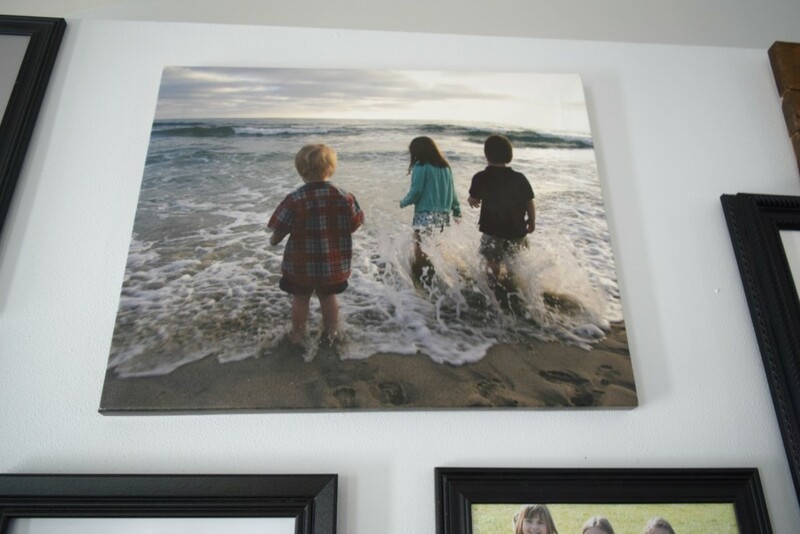 I like wall galleries too., Yours is great, I love the pic of the kids in the water. Thank you! I think that picture of my kids will always be one of my favorites. I like their way you explained the process you used to create this wall. You made it easy for others to do this in their own homes. Thanks, I tried to make it so that everyone can create one of their own. Some can be intimidated by the process. I hope it helped. I have the perfect wall space for this! I love the look and how it becomes the focal point in the room. 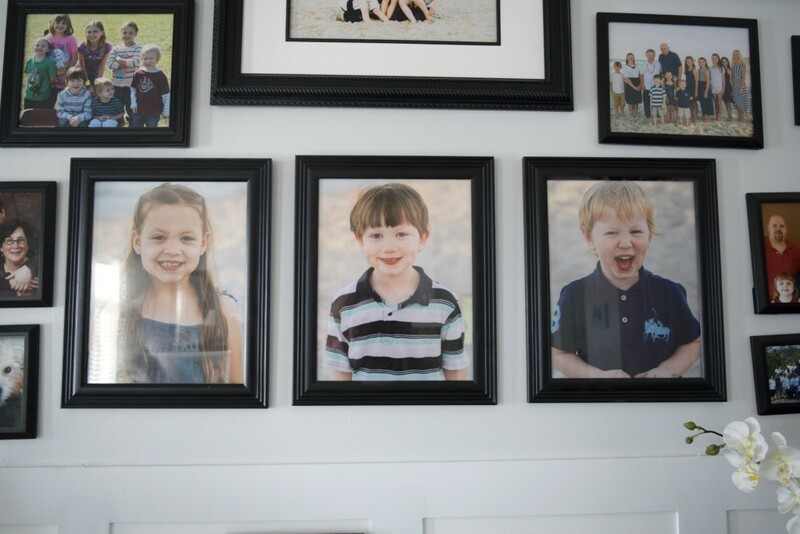 I have so many great photos that just need a frame to be incorporated into our own family gallery wall! I love gallery walls too! You did such an awesome job! I love how you added spotlight frames and a few frameless pictures, as well. Plus adding the taller items on the table really creates a balanced look. 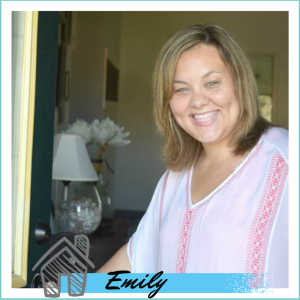 Your page inspires me! Wow, thank you so much for saying that. I am soooo happy I inspire you, that is what this is all about, so you can go and create it too. 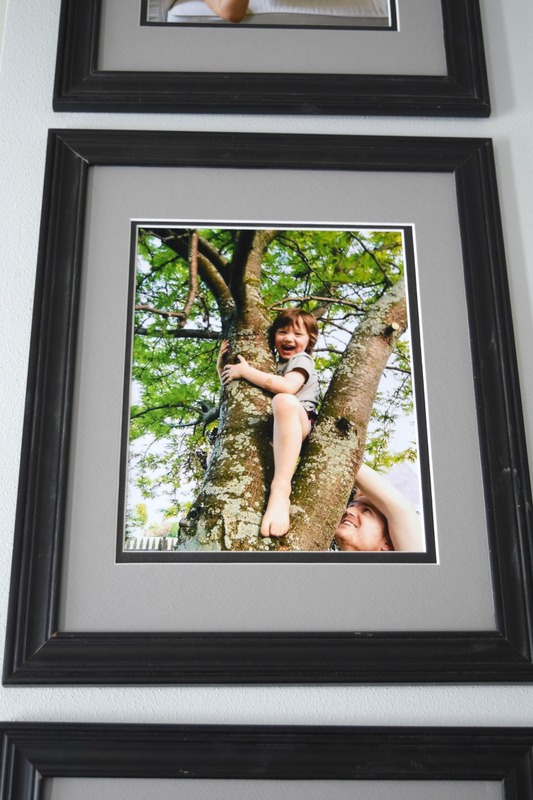 I love the idea of a gallery of photos on your wall, sharing the special moments that are dear to you.